All your motor needs from Air conditions, to your blower motor on your furnace. There are several different type of fractional horsepower motors. Each type performs certain jobs better than any other types. The characteristics of a motor designed to move air are completely different than those of a motor used to drive a grinder, a pump, or even a belt-driven application. Permanent-split capacitor, Shaded-pole, three phase and Capacitor Start motors. These motors are normally used with a fan blade or a blower wheel to move air. They are used in applications associated with heating, air conditioning, refrigeration, ventilators, and fans. The most commonly encountered air moving motors are Permanent-Split Capacitor and Shaded Pole types. FACT Used in variety of direct-drive, air moving applications where fairly low starting torque and high efficiencies are required. For example, Blower motor fans. FACT High starting torque motors with the nameplate RPM identified as 1725. Suitable for belt-drive applications such as furnace blowers, they are more efficient that Shaded-Pole motors but not as efficient as Permanent- Split Capacitor motors. FACT Highest starting torque motors with belt-drive capability. The capacitor is usually visible and mounted on motor frame. FACT The most efficient motors produced. They are used in industrial or large commercial applications where three-phase power is available. Use it for replacement motors our Heating & Air Conditioning business all the time. These two motors are universal reversible motors. They will fit most furnaces. The wiring diagrams and capacitors are included with the motors. Will include a new capacitor which you should replace with a new motor as it may not be the same rating as the old one with that old motor! You can view the wiring diagrams posted on the motors below. If you need any technical support on installing the motor feel free to email me. 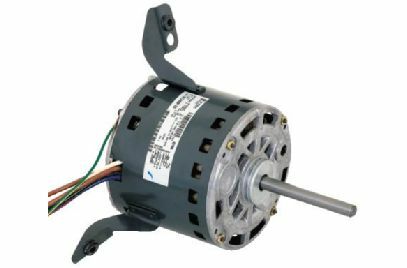 These motors come with a one year warranty from date of installation. I will provide a complete replacement motor if the motor is found defective. If you would like a quote on other motors that are not listed here, just Email me at dberry@1hvacparts.com. I will need the Furnace model and serial number. I will email you a price back within 24 hours.